As a regular user of DVD/Blu-ray discs and prefer to backup, copy, share or extract video/game content off a DVD/Blu-ray disc, you're probably familiar with MakeMKV, which is a rarely functional program enabling people to rip DVD and Blu-ray free. While, it is only free under a beta version and only supports MKV as output. Plus, some users complained MakeMKV is not working with Mavericks. So, ever considered looking for a MakeMKV alternative to convert Blu-ray, DVD much easier, especially on Mac OS X? If so, find out in the following paragraphs. Well, we want to share a great MakeMKV alternative for Mac (Mountain Lion, Mavericks supported)- Brorsoft Blu-ray Ripper for Mac with you. It helps you guys backup and rip Blu-ray/DVD to MKV losslessly, including any other popular video formats like MP4, AVI, MOV, WMV, FLV, M4V, etc. It also provides hundreds of preset outputs for you to directly convert and play BD/DVD on iPad, iPhone, iPod, Apple TV, Samsung Galaxy Tab, Kindle Fire HD, etc. In a word, it's a good alternative to MakeMKV and even works better. For those who are running in Windows (Windows 8 included), please get Brorsoft Blu-ray Ripper. Once install and run the software, click disc button to load Blu-ray, DVD content for converting. For ISO files, etc, you can also directly drag them to this program. 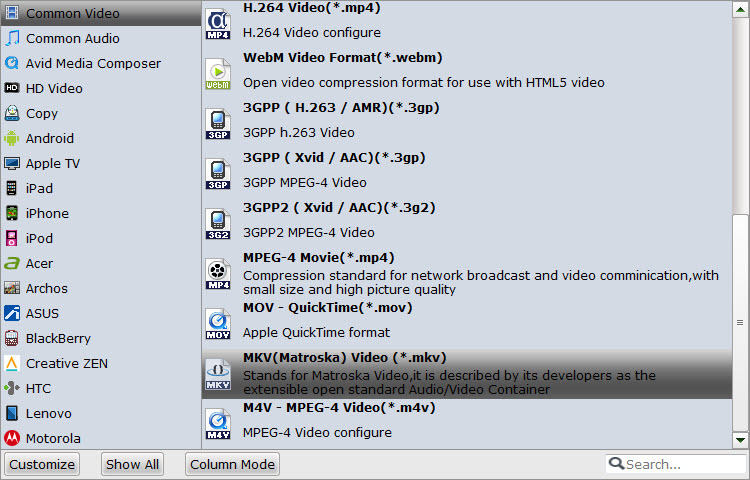 Click Format bar and go to the output format list of the MakeMKV alternative for Mavericks. All popular video & audio formats, even devices are contained here. It not only allows you to convert Blu-ray/DVD to MKV in high quality, but also convert to any other format like MP4, MOV, M4V, AVI, WMV, MP3, etc. That's why this app is better than MakeMKV. 1. If you want to customize the output video quality, you can click the "Settings" button to open the Settings window and set video resolution, frame rate, bit rate, codec, etc. 2. This app provides various video editing features, like cut, crop, merge, add video effect, add subtitles. If you want to edit your files, just click the "Edit" button to do it. After all necessary settings, click the "Convert" button and the software will start converting Blu-ray/DVD to the video format you've selected automatically. When the conversion is over, you can click "Open" to locate the ripped files and easily transfer them to your media player without any limit.